Homepage of this Kansas tribe includes cultural, historical, and government information, a section about the casino, and links. The National Indian Justice Center (NIJC) provides training and technical assistance to tribal court personnel, law enforcement, government officials, tribal social services/victim assistance providers and tribal gaming commissioners. Tribal Data Resources provides Native Americans and tribal governments with the tools and training necessary to increase their self-sufficiency through administrative resources. Tribal background, council members, local attractions, amenities, and events. Tribal council, news, legal information, and information about the casino and other tribal businesses. In Wisconsin. American Indian owned government relations and strategic consulting firm specializing in the representation of tribal governments and tribal enterprises. The official website of the Confederacy, featuring background information, essays, arts and handicrafts, commerce and tourism. Documents of the organization, historical materials, image galleries, statements, mailing lists and links are featured on this site. full range of legal services in connecticuts state, federal and tribal courts. albuquerque firm, offering legal, lobbying, and legislative consulting services to native americans and tribal governments. Official website of this Indian tribe (also known as Winnebago) offers information on government, tribal traditions, entertainment, and services. meridan firm, offering a wide range of legal services in connecticuts state, federal and tribal courts. Includes information about tribal government, health, education, languages, social services, native crafts, contact address, and links. Official site offers tribal news, history, a sacred site fund, and information about social services. Official homepage of this Maine tribe provides history, a map, e-mail directory of tribal services, and links. Through this technology you will be kept abreast of the Current and upcoming events, historic information, and highlights on tribal programs and services available to the Indian people. Explore the 'Slow Turtle Historical Wing' historical archives of the Seaconke Wampanoag Tribal Museum. Official site provides information on the two languages spoken by the tribe (Muscogee and Miccosukee), many aspects of their culture and history, and the tribal government and its services. Providing professional and technical, advisory services to the Little Pine, Lucky Man Cree, Mosquito, Sweetgrass, Moosomin, Poundmaker Cree and Red Pheasant First Nations. providing services to commercial businesses, government contractors, non-profit organizations, trade associations, tribal entities, and corrections contractors. Biblical biography of the Israelite tribal head. Biography of the Cherokee tribal leader. If the business hours of Prairie Band of Potawatomi in may vary on holidays like Valentine’s Day, Washington’s Birthday, St. Patrick’s Day, Easter, Easter eve and Mother’s day. We display standard opening hours and price ranges in our profile site. We recommend to check out pbpindiantribe.com/ for further information. 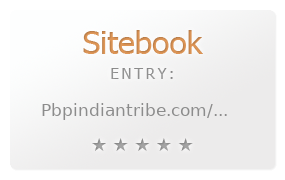 You can also search for Alternatives for pbpindiantribe.com/ on our Review Site Sitebook.org All trademarks are the property of their respective owners. If we should delete this entry, please send us a short E-Mail.